The Very Large Telescope (VLT) of the European Southern Observatory (ESO) and the Canada-France-Hawaii Telescope have discovered a planet that is freely wandering through space. It has no orbit nor a star attached to it. This planet free-floating planet is labeled CFBDSIR2149 and also referred to as CFBDSIR J214947.2-040308.9. Free-floating planets are objects in space that are not paired up or connected to a star. They roam the universe without a predetermined orbit since there is no star to supply the gravity to put them in their place. There have been previous discoveries of free floating objects but the data is insufficient to determine whether the objects are planets or brown dwarf stars. Since the two objects have the same mass, it is hard to distinguish one to the other. A brown dwarf star is a star that has a mass close to that of a planet making it too low sustain hydrogen-1 fusion reactions in their cores. A brown dwarf could be described as a star that has failed to shine. In the 1970's, the TV science fiction series Space 1999 had the premise that the moon was knocked out of orbit and is freely wandering through space. Although this would be nearly impossible to happen because of the gravitational pull of the planets and the Sun, the series tackled the adventures of the people who were at the moon base at the time. This premise is as close to what a free-floating planet is. 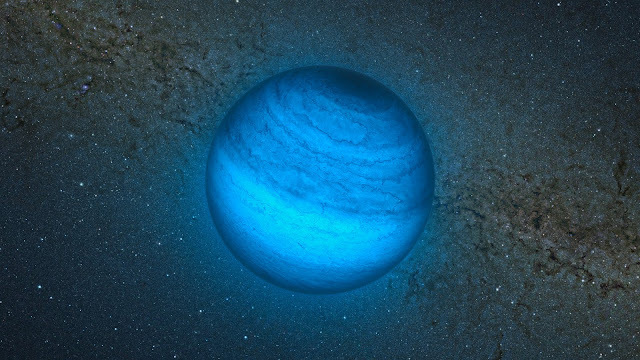 A planet that could have escaped the gravitational pull of a star or never had one in the first place. CFBDSIR2149 is believed to be part of a stream of young stars known as the AB Doradus Moving Group. This group of around thirty stars is believed to have formed at the same time and that all have the same age, have the same composition and that they move together through space. There is an 87% chance that there is a link between the planet and AB Doradus. If so, that will help deduce its age and classify it as a planet. If there is a link between the group and the planet, then it would pin down the mass of the planet to approximately 4–7 times the mass of Jupiter, with an effective temperature of approximately 430 degrees Celsius. The planet’s age would be the same as the moving group itself — 50 to 120 million years. Even if CFBDSIR2149 is part of the group, it must be noted that the planet has no gravitational link to any of the stars within that group. It is hard to detect a free-floating planet since most objects in space are observed through the light that they generate or reflect. With a free-floating object, there is usually no light to detect (planets reflect the light from its parent star or is detected when it is observed against the backdrop of the light of its star). But this drawback also has advantages. Without the bright light of a star overshadowing it, it is easier to determine details and data from the planet. Infrared light is used to observe objects like these.